No more secret trade agreements! We’ve learned from leaks that there are provisions in the TTIP and TPP trade deals that will lead to censorship. Some countries want to release the text, but the US is blocking the process. Wait! This is important. Don't close this page yet. We can only win this fight if we have enough people speak up and take action to stop the USTR from undermining democracy with a secret trade agreement. Can you share this petition with your friends? 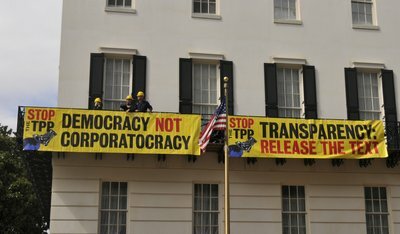 Last week, protestors greeted the USTR's last TPP negotiations scheduled this year with a sit in outside of the USTR office building. The USTR had the police promptly remove them from blocking their meeting. But even more activists are gathering to protest the TPP this entire week. Lawmakers and politicians are trying to make a last ditch effort to try to move the TPP forward without a public outcry. But we won't let them get away with this. That's why we need to make sure everybody knows what the USTR is doing. Share this with your friends, family and anybody you know. If enough people put enough pressure on the administration, we can expose the USTR for what hiding from us. This is urgent. Last week, USTR negotiators are hosting meetings for the Trans-Pacific Partnership behind closed doors. But as long as the trade deals are made in secret and without any public input, the negotiators are undermining democracy. This needs to end now. Here are the e-mails of the USTR negotiators. Send them an e-mail demanding that they release the text to the public. Be polite and talk about how trade deals should not be done in secret. The USTR is selling out the democratic process. In a break from transparency and the democratic process, the U.S. Trade Representative and the White House have decided to keep the Trans-Pacific Partnership (TPP) text confidential and out of reach from public scrutiny. The latest version of the trade agreement was leaked last month and it was confirmed that the text includes even worse restrictions on freedom of speech than predicted before. The White House and the USTR is working hard to advance the TPP and its censorship policies so that the public will have no input whatsoever in the process. On top of the TPP, the US is also the only country to have kept the TTIP trade agreement text hidden from the public. If the government is convinced they're negotiating in the public's interest, then they should be unafraid to make the trade deal public. 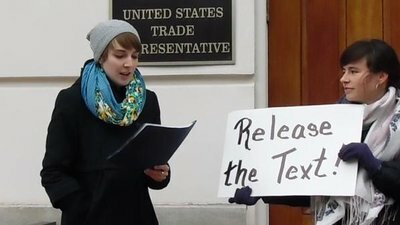 It's time for the USTR to release the text for all trade agreements.